EARN, NOT LOSE, MONEY AND TRUST IN YOUR BUSINESS: Protect your business from bankruptcy and fraud. Our Bill Detector stops counterfeit money at the door by authenticating any US dollar bill, Euro or Mexican peso in less than five seconds. 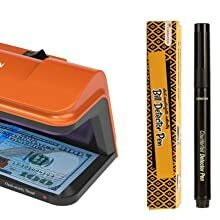 DETECT AND REJECT FAKE MONEY WITH THIS FRAUD FIGHTER: Our money checker and the free counterfeit pen are recommended for groceries, restaurants, retail stores, banks, and other businesses which regularly handle large amounts of cash payments. 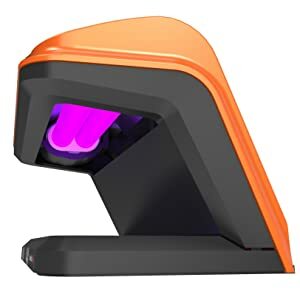 UV LIGHT CAPTURES SECURITY FEATURES WITH INVISIBLE INK: Our counterfeit detector can check if a passport or bill is authentic. Most currencies such asUS bills have an embedded polyester thread that glows visibly only under ultraviolet light. 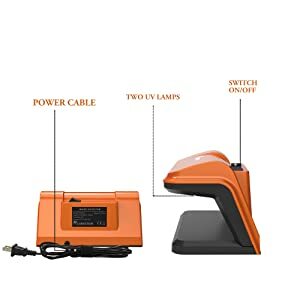 EASY UV LAMP REPLACEMENT ENSURES PROTECTION ALL THE TIME: When the light goes dim or becomes defective, quickly replace the 9w UV bulb by following the step-by-step illustrations in the user manual so your business can be on guard all the time. ONE YEAR WARRANTY GUARANTEES YOUR SATISFACTION: We at Carnation aim to deliver quality products at all times. In case you are not satisfied with the Money Detector, we offer a free replacement or refund within 30 days of purchase. To prevent fake money from ruining your business, you need to block it where it enters. With the Carnation Bill Detector, you're able to detect and reject suspicious bills before you accept them. Captures the embedded security thread that glows only under UV light. Our counterfeit Bill Detector is recommended for banks, stores, restaurants, and other establishments that handle cash. Copyright © 2019, Carnation Bill Money Counting Machines.